A big hug and thank you to Jess for asking me to participate in the Christmas Card Challenge! I decided to go with a retro theme (go figure) and use non-traditional colors. I designed and made the tree using the basic shapes in Open Office Impress, a free program, and made the inside pieces too. Then I printed them in black and scanned the page into my Brother Scan N Cut. 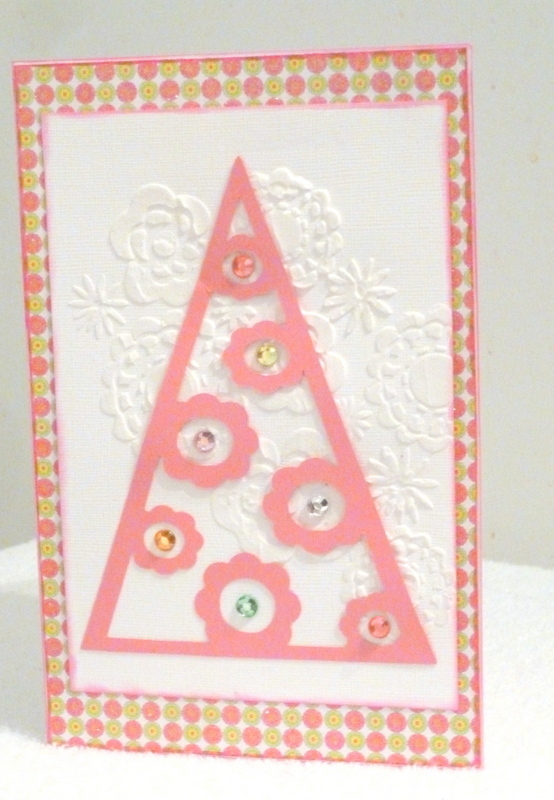 The shapes were cut out of pink card stock. I found the perfect paper in my stash from an old GSD line and a coordinating paper from WeR Memory Keepers. I didn’t expect to use classic paper lines but the colors were so great! The white background is Wendy Vecchi embossing paste through a Claudine Hellmuth stencil. After placing the tree on top, I embellished with bling and it was done. 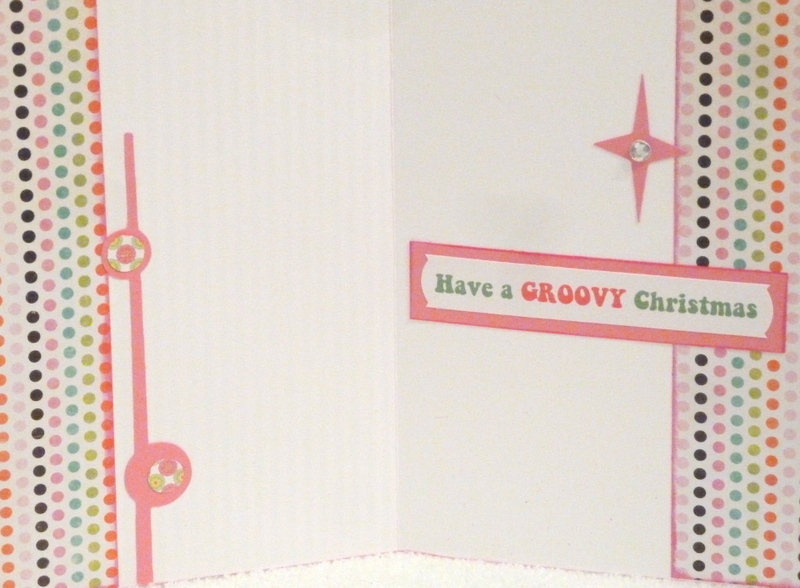 For the inside of the card, I placed two coordinating strips of paper on each end and added my cut shapes. 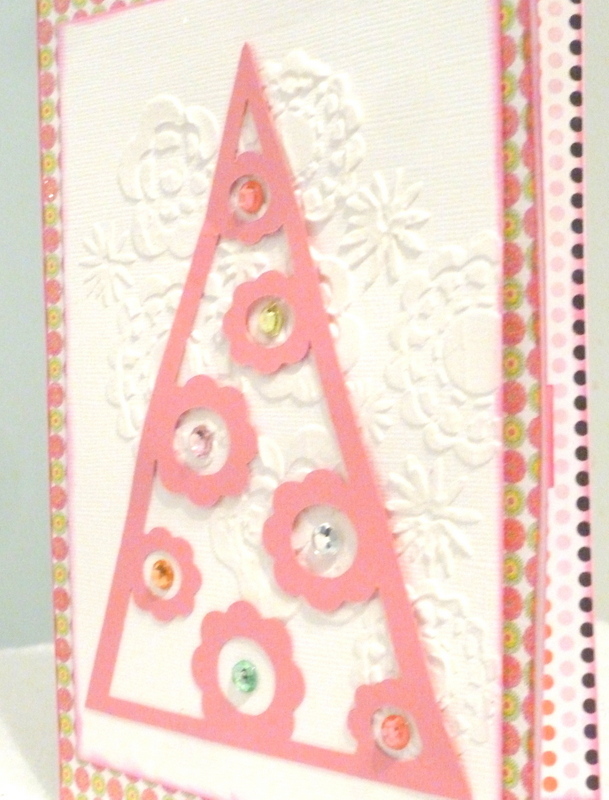 I placed paper circle accents on top and a gemstone in the star. The sentiment was printed on my computer. I don’t usually have the patience to cut and line up letters! You can find Darcie and her sister Johnna’s wonderful mini albums here. Darcie gorgeous card so glamorous!